Quién Manda. How did we do it? The map of power relations in Spain. Do you want to know who sits on the most influential boards and what is their connection? Add this functionality, with a preious control system to ensure propoerty rights and information rigour. 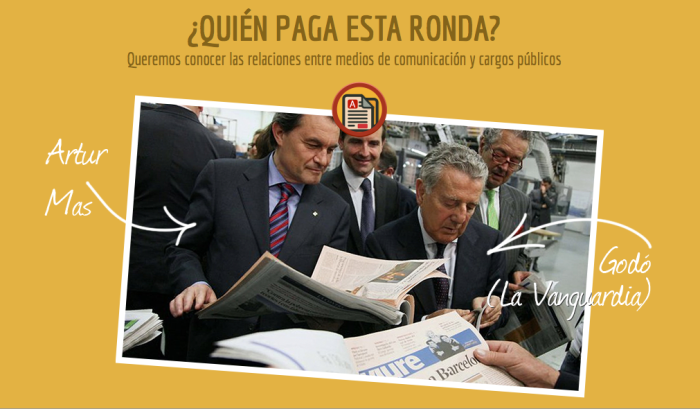 Quién Manda (www.quienmanda.es) is Civio’s latest project, a data-based website untangling relationships between Spain's public & private sector. 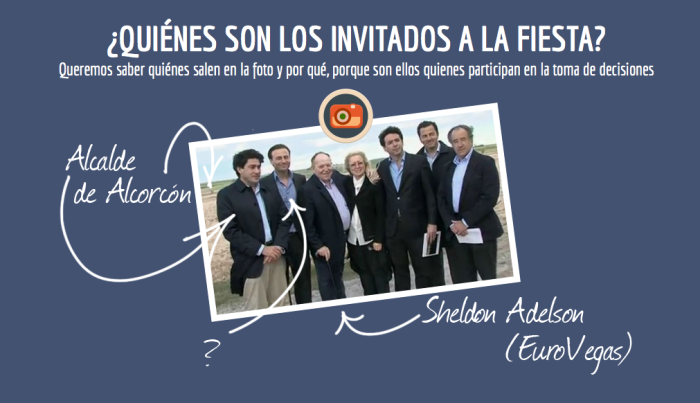 The current version of Quién Manda, a basic one, includes a database with over 2.500 key documented power relationships, over 100 tagged photographs and a series of lead articles unravelling relationships between Spanish public officials and private corporates. Now we want to unleash the entire potential of the tool. We need to disclose more profiles, set more connections, write more stories and implement a more advanced application to show the relationships between political and economic power fully and deeply. What for? 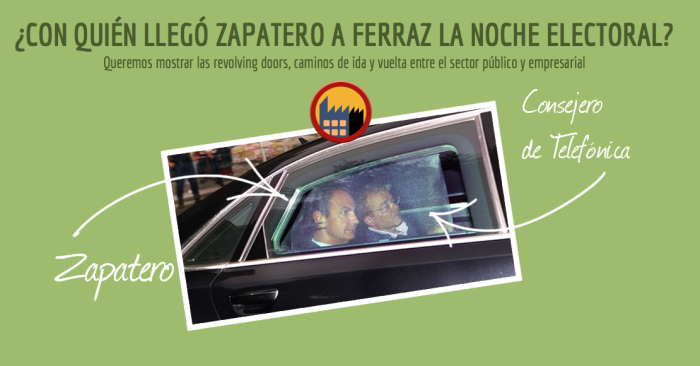 In Spain, lobby activities are not regulated and, therefore, too many decisions are taken behind closed-doors, in secrecy. 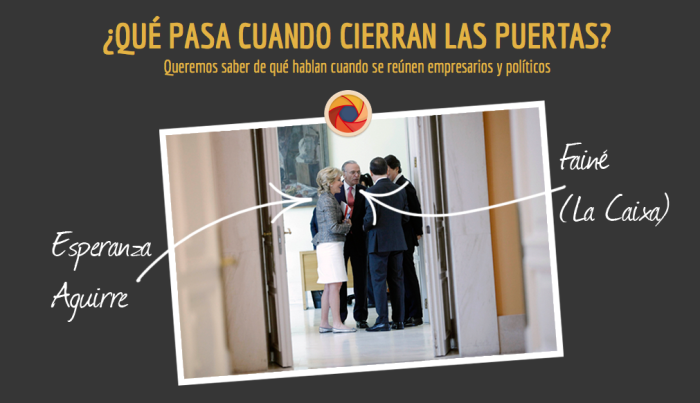 We campaign to regulate lobbying activities and to gain public access to public official’s agendas. We demand to know how decisions are taken and under whose influence. The objective of this crowdfunding campaign is to develop the site, unleashing its entire potential; to continue researching and publishing weekly articles; and to attain lobby regulation. There is much work to be done. We will publish a weekly article, always precisely documented and based on verified data, to analyse a particular topic. We have a long list of topics: public procurement, media, previous relations between political and economic elites and countless relationships to bring to light. This project is crucial to reduce opacity in decision-making processes. We need a mandatory registration of every influent group of interest (their budgets, their members and their goals) and to know who do our representants meet with. We want our public officials to show that they have nothing to hide. With this campaign we intend to enhance the platform and keep all the information updated, at least, until June 2014. This project has been initially developed thanks to a grant from Global Integrity awarded in the context of their Testing 123 Innovation Fund, worth $ 10,000. 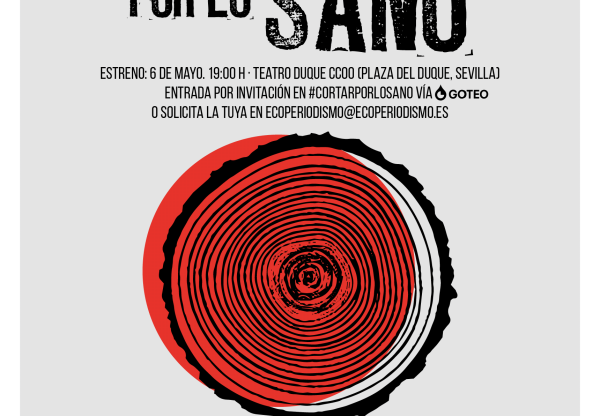 Civio is a civil society non-for-profit organization founded in Madrid in December 2011. 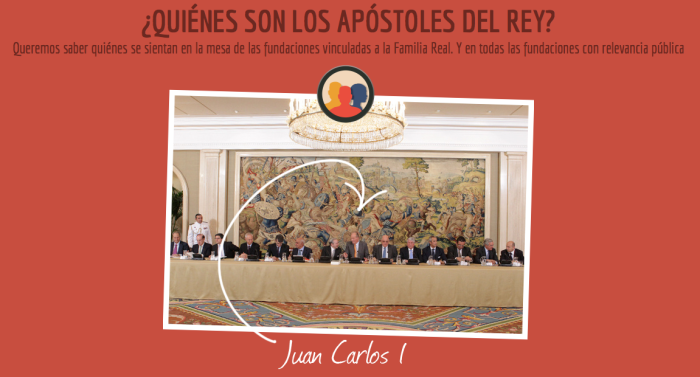 Previous projects developed include the Spanish version of Where Does My Money Go and a Freedom of Information Q&A site –created together with Access Info Europe–, that we continue to use while campaigning to get an FOI law approved in Spain. We have also organized data-journalism seminars and training courses for institutions, journalists, developers and big media, leveraging the experience we have obtained building highly-focused sites on forest fires, governmental pardons or regularly monitoring and scraping the country’s official gazette. Our team is multidisciplinary and consists of David Cabo, director of Civio and computer engineer, responsible all the development of the portal; Eva Belmonte, the lead journalist responsible for finding and digging relationships and stories; Javier de Vega, taking the whole issue of communication and Cristina Moreno supporting partnerships. Hugo Garrido, journalism student and intern, has supported the team in this endeavour. All the code developed for the implementation and subsequent improvements will be open source. Quién Manda serves as a reference tool, open, public and free for anyone, including particularly interested groups such as journalists, civic organizations or researchers. Help us to spread the project, share by email and social networks! We accept research suggestions. Much better if they can be supported with documents.